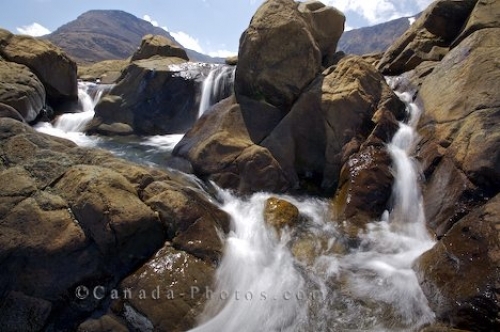 A waterfall rushes over the rocky landscape along the Tablelands Trail in Gros Morne National Park in Newfoundland Labrador, Canada. A walk along the Tablelands Trail in Gros Morne National Park in Newfoundland, Canada brings to light the beauty of the area especially when you cross paths with a scenic waterfall. The water rushes over each tier of rocks until it reaches the bottom pool creating an opportunity for a nice waterfall picture. Picture of a beautiful waterfall as it maneuvers over the rocks along the Tablelands in Gros Morne National Park, Newfoundland.